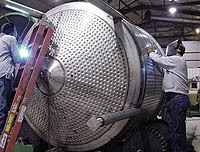 We can custom fabricate new tanks or modify existing tanks to meet your specifications. Our maximum size is 12 feet in diameter and 40 feet long. We build Single Wall or Double Wall Insulated Tanks with optional Heat Transfer Surface. Also, we can grind and polish to 3A dairy standards if needed. We fabricate in both 304 and 316 Stainless Steel and specialize in Cone Bottom Vessels. Download the brochure sheet for this product now. Our Super Clean Conveyor is a natural for the new “No Hollow Member” quality standard. Our solid 7 GA Cross Members use a pin and notch system to locate the solid Wear Bars which allows for thermal expansion without warping. The optional “Quick Release” system allows for cleaning and/or the removal of the Wear Bars without tools for quick and easy cleaning. The complete tail pulley assembly can be disassembled by removing three pins. Conveyors can be supplied with stainless steel frame motors, gearboxes, or motorized pulleys. 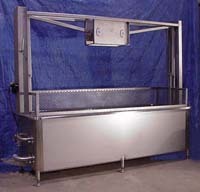 We will also build conveyors to your design, if requested. Our Traveling Drop Deck offers safer access to tanker manways for plants that ship or receive liquid products. Since the truck can’t haul a safety handrail down the highway and you can’t depend on employees or operators to wear a safety tether, we have a solution to the problem. Our solution, allow a short section of catwalk (Drop Deck) to drop down to the top of the tanker and move horizontally to align with the manway because it is difficult for the driver to stop in the exact position. The 48" x 48" stainless steel handrail loop that remains level, regardless of truck height, meets OSHA guidelines for safety handrail. Our air powered traveling system provides a place for the operator to ride while moving the Drop Deck so he can stop in the exact position. Getting the parts in and out of the hot and harsh liquids on a COP System is a safety risk you no longer need to take. Our Lift Basket is air operated and stays level with a unique linkage system that is simple and foolproof. 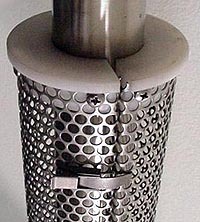 The system can be equipped with a lid and exhaust system to direct steam and fumes into an exhaust system. The air operated basket has an 800 pound lifting capacity which will reduce back strain on the operator while loading and unloading parts. Protects employees from "hot" pipes in "Wash down" locations where normal insulation gets soaked or destroyed by water. Shields can be removed easily when necessary for complete sanitation. Standard units are made from 304 Stainless Steel with Nylon insulators for up to 300 deg. F applications. Teflon insulators are available for up to 450 deg. F applications. Standard units fit 1" through 4" pipe and tubing sizes and come in lengths of 24" and 48" (Custom made lengths available). To download our brochure, you will need Adobe Acrobat Reader. All contents © 2006 Stainless Steel Ltd., except where indicated otherwise. All rights reserved worldwide. Duplication or reprint only with express permission from Stainless Steel Ltd. All trademarks are property of their respective owners.Website designed by Web Graphiti.com.